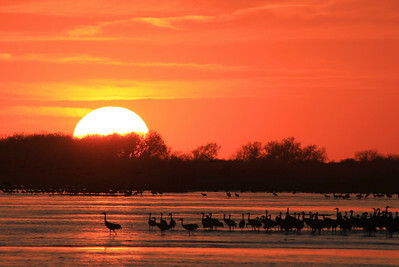 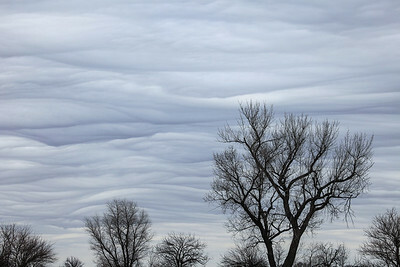 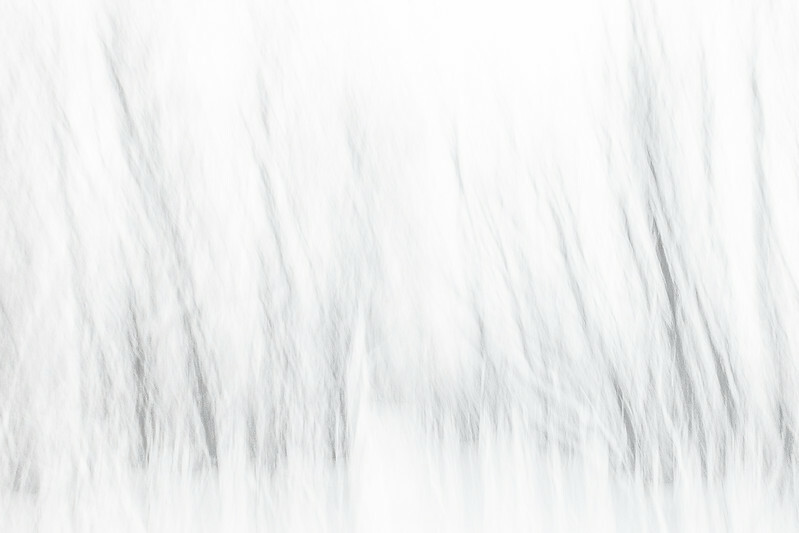 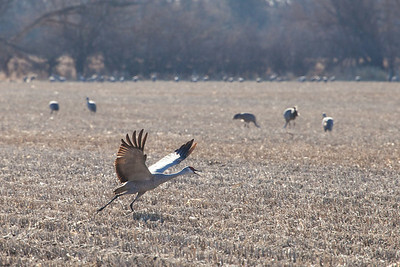 Each year in Nebraska, the Platte River between Grand Island and Kearney plays host to the largest gathering of Sandhill Cranes in the world. 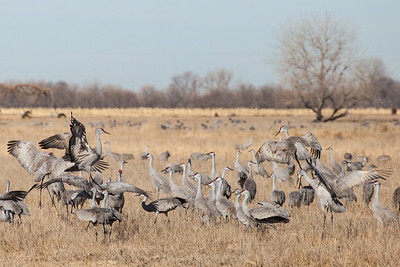 It is estimated that approximately 500,000 cranes make a "pit stop" on the Platte River to rest and refuel before continuing their annual migration north for the summer. 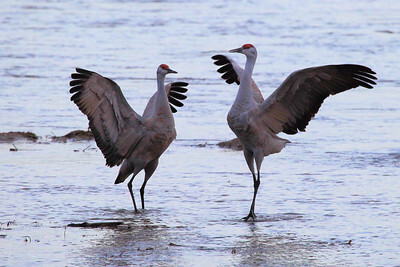 This small stretch of the river is critical habitat needed by the cranes because of its shallow depth, multitude of sandbars which provide safe roosting at night and plentiful food via countless nearby farm fields. 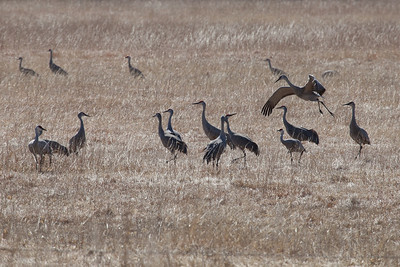 During the day, the cranes disperse into the surrounding farm fields to feed on waste grains and any other food they may find. 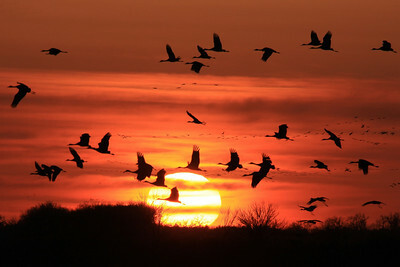 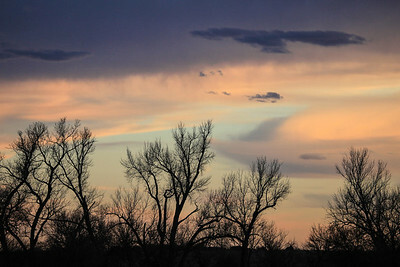 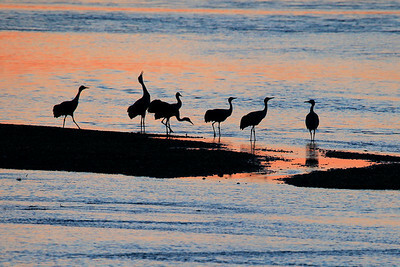 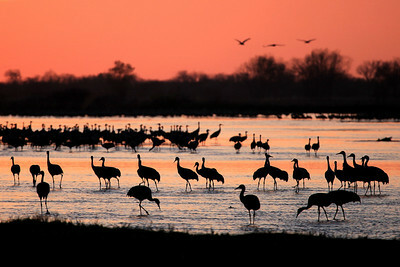 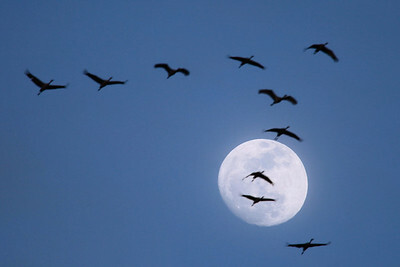 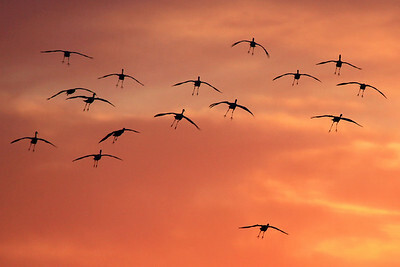 Each evening, the cranes start to make their way back to the river. 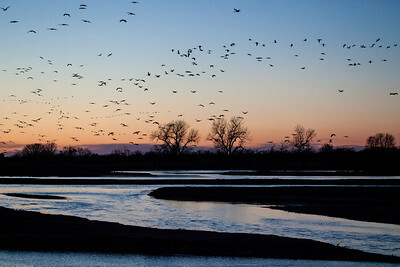 They roost for the night along the river on the sandbars, which provide needed protection from predators. 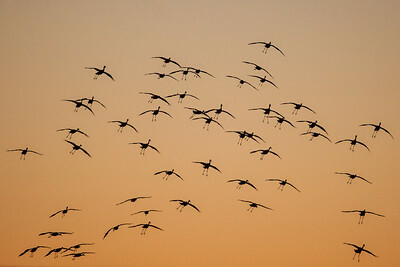 At sunrise the next morning, they disperse once again to feed for the day. 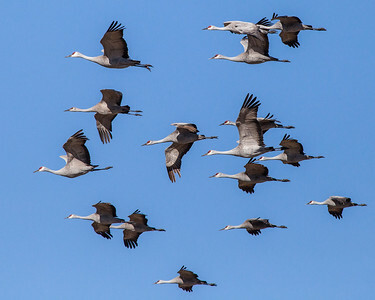 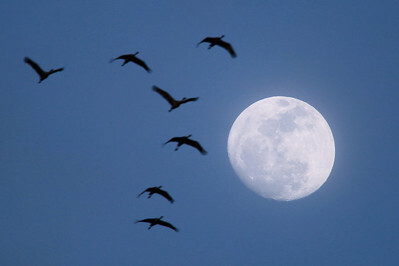 The cranes spend about a month resting and feeding along the Platte, generally from early March to early April, then continue on their way north. 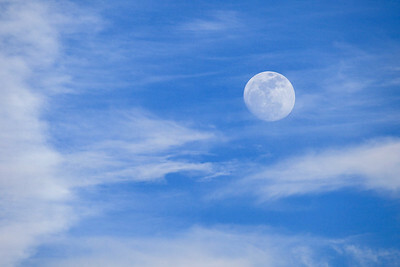 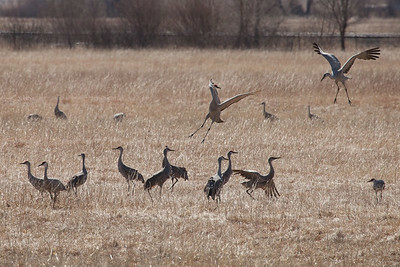 Mid-march is generally considered to be the peak week for the birds. 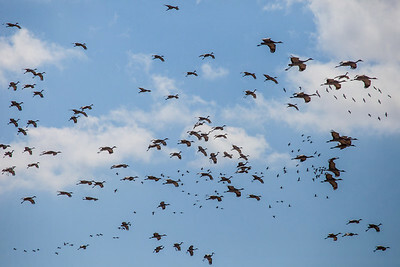 This gathering on the Platte is one of nature's great wonders and if you have the chance to experience it, you will never forget it. 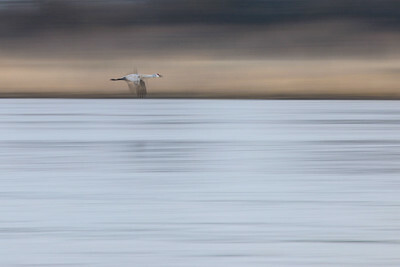 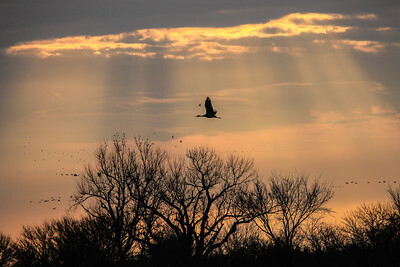 NEBRASKA 6506 "Morning Flight through Rays of Light"
NEBRASKA 7143 "Surreal Sky over the Platte River Valley"
NEBRASKA 7420 "Cruising the Platte River" A slow shutter speed makes for an abstract image of a solitary Sandhill Crane as it flies downstream along the river. 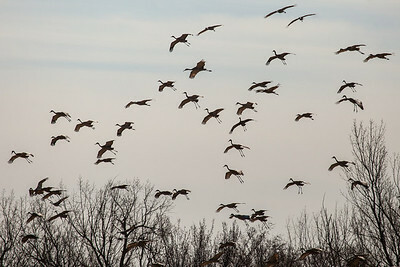 NEBRASKA 1850 "Sandhills over the Platte River"
NEBRASKA 1982 "Field of Dancing Cranes"
NEBRASKA 2048 "Field of Dancing Cranes"
NEBRASKA 1842 "Coming in for a landing"
NEBRASKA 1747 "Cranes and Clouds"
NEBRASKA 2162 "Rowe Sanctuary Sunset over the Platte River" Sandhill Cranes fly towards the sun as they prepare to land on the river to roost for the night. 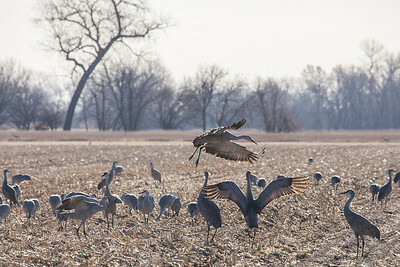 NEBRASKA 2325 "Landing gear down!" 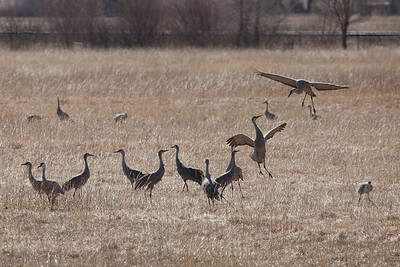 Sandhill Cranes dropping from the sky, preparing for a landing in a farm field. 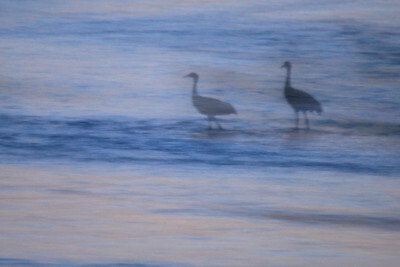 NEBRASKA 7513-2 "Sandhill Cranes and Moon"
NEBRASKA 2080 "Nebraska Sunset over the Platte River"
NEBRASKA 6331 "Sandhill Silhouettes" A slow shutter speed combined with a panning motion of the camera provides for a dream-like image of this pair of Sandhill Cranes on the Platte River. 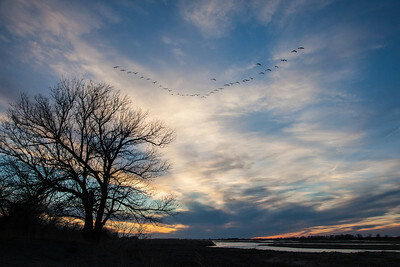 NEBRASKA 6616 "Spring sunset over the Platte River" A large group of cranes flies past the sun as it sets over the river. 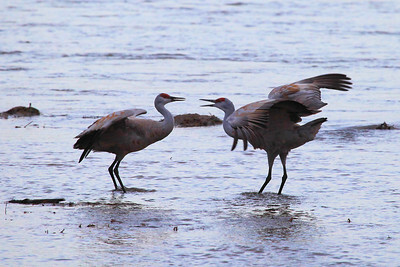 This group of cranes landed in a farm field on the opposite side of the river, but soon took flight again and landed on the sandbars in the middle of the river. 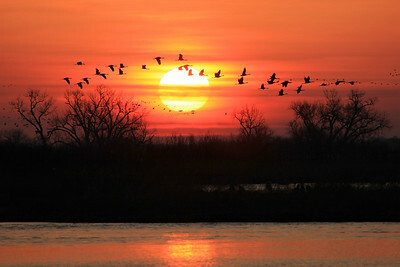 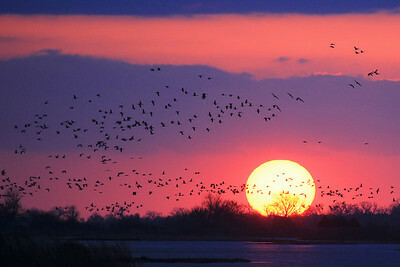 NEBRASKA 6365 "Winged Migration" Sandhill Cranes fly in front of the sun as they leave the Platte River at sunrise. 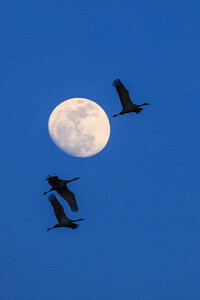 NEBRASKA 6353 "Sandhill Cranes and March Moon"
NEBRASKA 6354 "Sandhill Cranes and March Moon"
NEBRASKA 6040 "Gathering of Cranes at dusk on the Platte River"
NEBRASKA 6033 "Sandhill Crane Sunset over the Platte River"
"Morning Flight through Rays of Light"